Our computer centre is fully equipped with the latest technology in computing. We have 10 broadband enabled computers using the most up to date Microsoft software. Our trained staff are on hand to provide assistance at all times. The following are just some of the services we provide. To find out more about the individual classes click on the links or contact us. 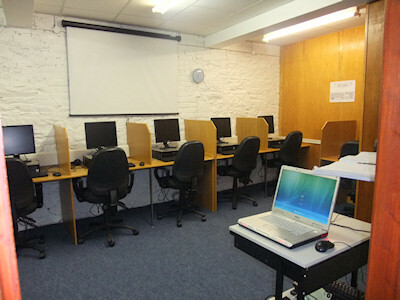 The computers are available to the public for personal use (e.g. to use the internet) Monday to Friday 9.30am - 5.00pm. Consultation and Assistance with all areas of computer Technology e.g. Communications, Program/Music downloads, Photography etc. Instruction on Surfing the Internet and sending Emails. Instruction on Skype, Ebanking and Mobile Phone Texting.